Okay, men. Can you just leave Candy alone for a hot second? Number one, she presumably still lives with her parents (this isn't called "Candy's Rental Apartment" or "Candy's Duplex" after all) so it is not appropriate at all for you to be giving her diamonds and/or toys. Number two, it sounds like she's deeply depressed and engaging in self-destructive behaviours, or at the very least dabbling in some teenage poetry, so I think it's best for everyone if we just give her some space to figure herself out. That being said, if Candy the person is half as hot as this track, I can see what all the fuss is about. It's got adrenaline. It's got fun keyboard riffs. It's giddy and sweet and melancholy AND prominently features several lines about driving in the dark, because as we all know that's how Bruce expresses almost every emotion. (Or at least the big three: Love. Angst. Indigestion.) Do you think at this point, Bruce Springsteen has spent as much time singing about being on the highway as he has literally spent in a car on the highway? Researchers, please forget about saving the ozone or whatever and get on this. Rating: 9 strangers from the city out of 10. This makes me feel: like I want to know more about Candy. What pictures of heroes are on her wall, exactly? Are they Teen Beat posters, or like, presidential portraits? 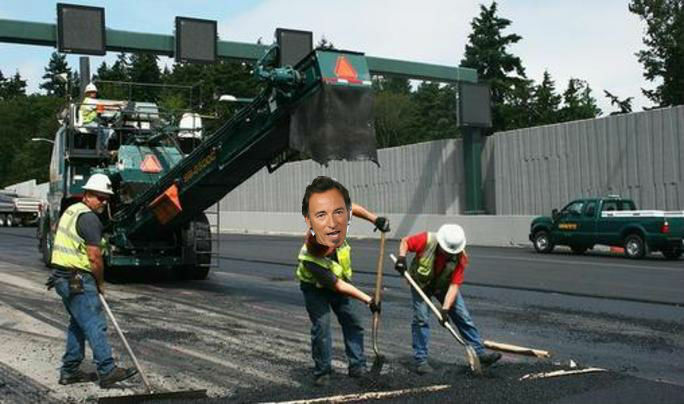 Fun Bruce fact: Bruce has never had a job besides being a musician. I think it's pretty obvious though that his real dream is to be a highway repairman. Maybe one day, B. Hang in there, buddy.